Holly Shaw: Sensing a Trend Here? Contrary to recent posts, this is not really a decorating blog. If you have been waiting patiently for a post about running, well...sorry about that. Since I haven't been doing a whole lot of running lately, it turns out I have very little to say about it right now. Go figure. And so my figure is. However, blogs are reflections of us, what we are *into* and what's happening in our lives. Clearly I've been into nesting and decorating lately, so I have a bit more of that to share with you. A few weeks ago we went shopping in our garage. Love that. Scott cleaned up several pieces of furniture and we hauled them inside. Love that too. 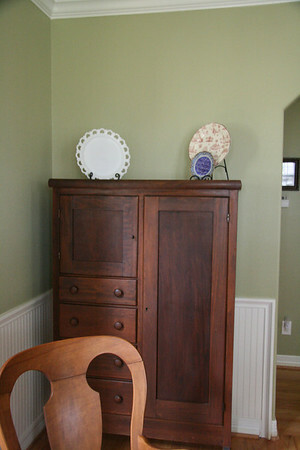 This is my old dresser from my childhood bedroom, now in our family room. It really makes me happy to have it in there, plus the mirror helps reflect more light. There are also three drawers perfect for holding whatever (maybe A. 's art/craft supplies and coloring books, maybe candles, we'll see). I am on the lookout for plates to do an arrangement above the mirror. This is my grandparents' antique wardrobe. I know, kick me please, it's been out in our garage for years, now it's in our parlor. I'm not sure what I'll arrange on top, I'm thinking a small lamp for sure. Right now I just have some plates, which make it look like they are for sale or something. Let's just all reflect on how wonderful Hobby Lobby is for a moment. Their florals were 50% off this week, so it was a perfect opportunity to get some filler for the pitcher on our mantel. Cheap. Here's how the mantel looks now, along with my first mistreatment (which one of our cats now uses to sleep behind, so glad I could oblige her). I saved my favorite addition for last, which is in our foyer. This was my grandparents' dresser. At one time I thought about painting it black. I might still someday, but remember, I'm lazy, so I just put a table runner over the top to hide some scratches. I did splurge a little on lamps from Target, but I fell truly, madly, deeply for them and had to have them. Had to. Hobby Lobby also had their mirrors 50% off, so this cute little round one came home with me. I might hang it, but remember, I'm lazy, so it's just propped up on the dresser for now. I went through a milk glass phase a few years back, so these two plates are from that. The two doves are pottery pieces that my mom made way back when. They have her initials on the bottom, love that. I tossed the lemons in the apothecary jar on a whim. That's one thing I'm looking forward to changing around seasonally or when the mood strikes. 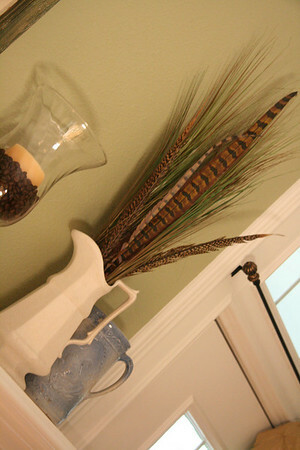 Having the antique pieces in our home now not only fill the spaces better, they bring in memories too. Love that the most. Love the antiques and I agree it is the happy memories that make them even more special. I am coveting those lamps from Target. I fondle them every time I go....I just KNOW they will go on sale sooner or later?!?!?!? Mixing the old with the new - I love that too. Those are beautiful pieces and I can't believe they lived in your GARAGE before! Very pretty decorating! I love those Target lamps too, they're so fun! 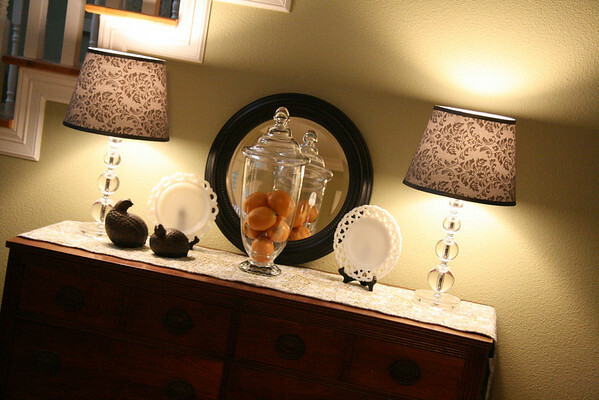 I saw those lamps at Target too, but they didn't end up in my basket...They look great! I also heart the oranges! 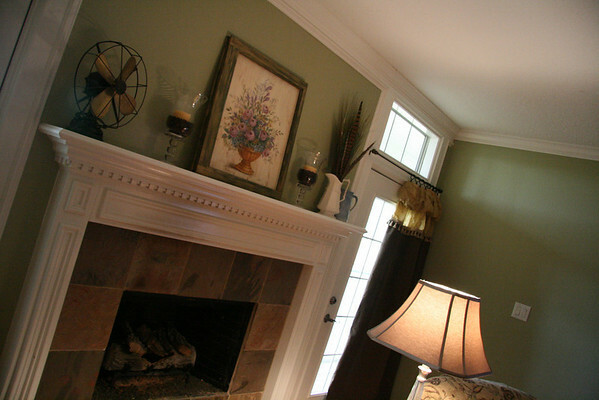 These new additions to your home warm it up so and make your already beautiful home shine even more. Old family heirlooms add so much to a home. You have absolutely WONDERFUL taste. I have loved watching your nesting adventures. You just get it right everytime. I need to go shopping in my garage. And a tip for finding plates? Wait for your soon trip to the 'ville and I know right where you can get some! I am so EXCITED about your trip too. Wow, these are all substantial furniture additions! They look so great. I love seeing the results of all your nesting fun, keep them coming! Everything looks great. I "shop" in my basement quite often. Never find any great furniture like you do, though. What a beautiful eye you have. I can't believe you just had all that stuff lying around. It all looks so homey and functional! i love the furniture- especially the armoire! those lamps are incredible! i love them!!! i may have to run to target to get one for baby's room. they are great. That last photo looks like it is STRAIGHT OUT OF MARTHA. No kidding. 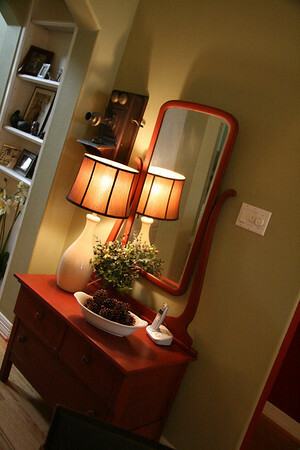 I also love the lamp on your childhood dresser--where'd you get that one? I love target, love hobby lobby, and even better that you can shop in your garage! Man, my house needs me to shop in your garage! I can't believe we left them to moulder in our garage for so many years, victims of my indecision. In weak moments I even thought of selling them in a garage sale. Really glad we didn't! Those lamps are in the mix & match area of TarJay. Wow, the only thing I inherited from my family is bad knees and stinky feet. Hahaha--I got big feet with bunions. I'm glad you pulled your memory makers out of the garage! they are beautiful.